The weather’s been pretty awful lately, at least by my standards. It has gone from – 10 °C to 15 °C and back down to the minuses in a matter of days. We went from winter to late spring and then back to winter again. I realize that with the winter Olympics still in our thoughts I sound like a total wimp. I know it’s beautiful (from the inside of your home with a hot cuppa in your hands) but I just don’t have the slightest wish to go outside if I can help it. Consequently, Mr. AP and I have been spending more time than usual indoors, and more time attending to one of our favorite hobbies, board games. While it is quite popular to do top anything list these days, I would not be able to tell you which specific game is my favorite. However, one thing is for sure, Caverna is up there at the top. It has everything that I love: a bit of worker placement, a bit of engine building, lots and lots of components, but tucked there among all the goodies, an awful rule book. 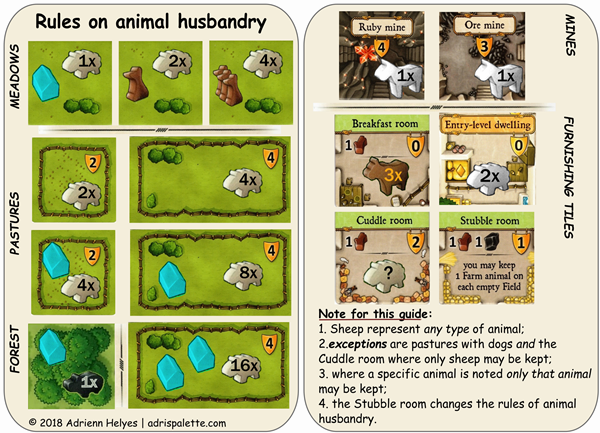 Case in point, while most of the rules of Caverna are easy enough to understand – when you are reading it for the third time that is -, the rules of animal husbandry (i.e. animal care and breeding) are just mind-boggling. They are a test of my logic, intelligence and – frankly speaking – my nerves. Even after reading it for the umpteenth time I felt I was struggling to make heads and tails meet. And I found, that one of the issues that I had was that there was just too much text and nothing to really hold on to. So I got me a piece of paper, a pencil and started drawing. It took me lots of reading and re-reading, some paper crumbling and even more erasing to come up with this. I was so happy with the outcome! We finally had some help while playing! Woohoo! Unfortunately, I found out pretty quickly that my A4 sized guide is just too big and clumsy. When the game itself takes up a lot of table space, this just proved to be too big. Also, with use we found that there were some tiles that I missed to add at the beginning. Skipping ahead a couple of months in the story, I started playing with Inkscape recently. As I was watching video tutorials and learning its basic functions I realized that working on a personal project that interests me would speed up my learning process considerably. That’s when I took out my Caverna player aid, dusted it off and started working. And this is what I came up with. 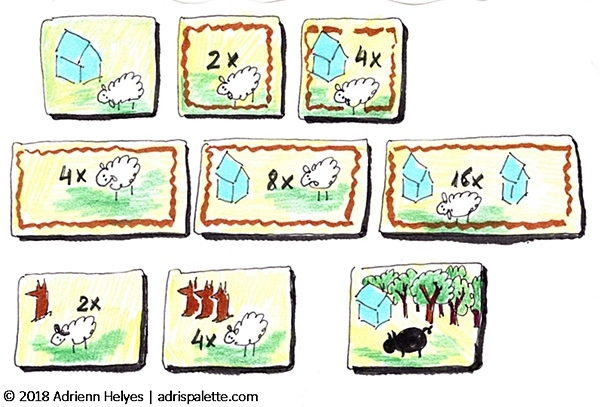 I rethought the content and the layout and took into account all the lessons-learned we had from our games. I decided to make it into a card format, so that after printing it could be slipped into a card sleeve and be used along with the other player aids during the game. All graphics have come from the rule book itself. But the how is the end result of my litte brainstoriming session. With its smaller size, clearer pictures, and easy to understand explanations I was excited to give it a go. And the end result? I quite like it. I think it is small enough so that it does not interfere with our play, but large enough for all the icons and text to be legible. 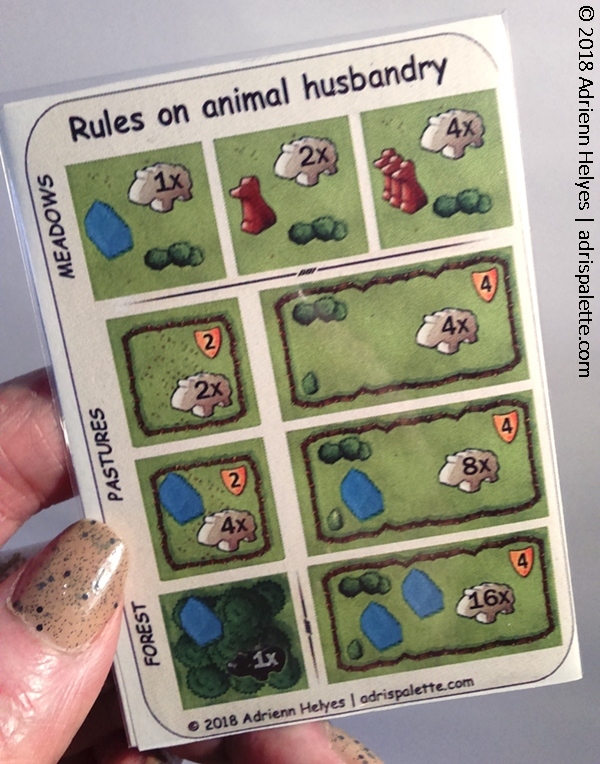 And I am happy to report that it has fared well during game: it is now much easier to figure out how many animals fit were and what you can do with them during game. Quicker decisions, less gray hair, it’s a win-win situation for me! Do you like the end result? Would you like to use the player aid during your game? Click here to download and print it for your own use. Enjoy!